I took this photo on an overcast day, outside a little village in the Connemara region on the West Coast of Ireland. It was a remarkably low-key affair, but one of great importance and seriousness to the local folk. 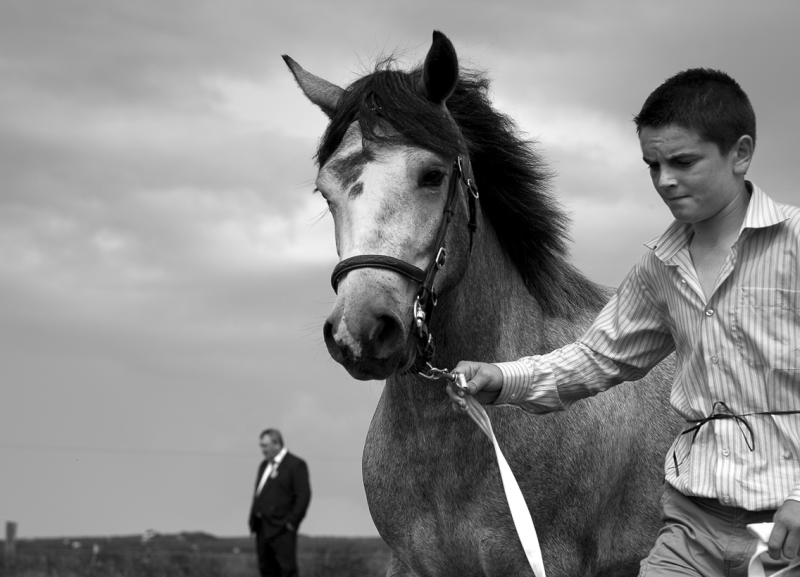 This young man was competing with his beautiful horse against many wealthy suit-and-tie dressed owners. There is a mysterious and somber quality here, with it’s hints of tension, movement, and beauty. The judge is a dim figure in the background and hints at a narrative….to be completed by the viewer, perhaps? I like to consider myself a project-oriented humanist documentary photographer. After years of deep inward study and reflection, there is now an effortless flow of images from my camera, reflecting a long sought integration. In the words of Goethe, “In his own magic circle wanders the wonderful man, and draws us with him to wonder and take part in it.” I am deeply happy to have found my place, camera in hand, in this world. My work has been exhibited in museums, published in LensWork, and has won awards in juried shows.